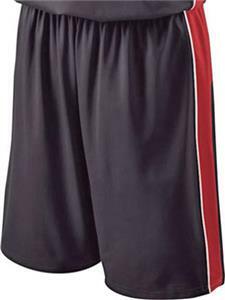 Holloway Ladies' Majesty 4-Way Stretch Basketball Shorts - Closeout. Dry-Excel Fresh 4-Way stretch, nylon/spandex knit colors and polyester/spandex knit white. Ladies engineered-fit. 4-Way Stretch for non-restricted movement. Wicking and anti-microbial. Tri-color design with breathable Dry-Excel Perform Stretch Micromesh blocking placed along heat zones. Gripper elasticized drawstring waist. 8" inseam. Top Selling Item. WAIST (on half) 12" 12.5" 13" 13.75" 14.625" 15.625"
HIP (on half) 21.25" 22.25" 23.25" 24.75" 26.5" 28.5"
WAIST 25-26" 27-28" 29-30" 31-32" 33-34" 35-36"